[February 16, 2009] TOKYO (AP) -- Secretary of State Hillary Rodham Clinton, in Tokyo to begin her first trip abroad as President Barack Obama's chief diplomat, said Washington's alliance with Japan is a cornerstone for the U.S. and warned North Korea to live up to its commitments to dismantle its nuclear programs. She arrived Monday in Tokyo to a large group of dignitaries, including two Japanese astronauts who flew on the U.S. space shuttle. Clinton is in Asia to meet with the leaders of Japan, China, South Korea and Indonesia. "The bilateral relationship between the United States and Japan is a cornerstone in our efforts around the world," she said. "We will be looking for ways to collaborate on issues that go beyond just our mutual concerns to really addressing global concerns." Clinton said the main issues on her agenda included climate change, clean energy and nuclear proliferation, along with the global financial crisis. "I have come to Asia on my first trip as secretary of state to convey that America's relationships across the Pacific are indispensable to addressing the challenges and seizing the opportunities of the 21st century," she said. Her message on the plane before arrival was focused on North Korea. "The North Koreans have already agreed to dismantling," she said. "We expect them to fulfill the obligations that they entered into." During the now-stalled "six-party talks," Pyongyang agreed to stop its weapons work in exchange for economic and other incentives. On Monday, the 67th birthday of leader Kim Jong Il, North Korea claimed it has the right to "space development" -- a term it has used in the past to disguise a missile test as a satellite launch. Pyongyang's official Korean Central News Agency accused the United States and other countries of trying to block the country's "peaceful scientific research" by linking it to a long-range missile test. Last week, Clinton warned North Korea against any "provocative action and unhelpful rhetoric." During her plane trip, she implicitly criticized the Bush administration for abandoning the so-called 1994 Agreed Framework with North Korea, reached during President Bill Clinton's first term in the White House, which called for the North to give up its plutonium-based weapons program. The framework collapsed when the Bush team accused Pyongyang of maintaining a separate highly enriched uranium program, about which Secretary Clinton said there was still great debate. As a result, she said, the North had restarted and accelerated its plutonium program, allowing it to build a nuclear device that it had detonated in 2006. Clinton said one goal of her trip was to demonstrate a new U.S. commitment to work with Asian leaders on "problems that no one nation, including ours, can deal with alone." The administration's goal, she said, is to push climate change and the global financial crisis to or near the top of the agenda. Ongoing issues like North Korea's nuclear programs and human rights in China will remain priorities, she added. In Tokyo, Clinton will try to reassure a jittery nation of the importance the United States places on ties with Japan and will sign an agreement to move about 8,000 of the 50,000 Marines on the island of Okinawa to the U.S. Pacific territory of Guam. In a nod toward Japan's role in international affairs, Clinton is also expected to announce that she will send the special U.S. envoy for Pakistan and Afghanistan to a Japanese-hosted donors conference for Pakistan. Clinton is also promising to meet with the families of Japanese citizens kidnapped by North Korea in the 1970s and 1980s. "We do want to press the North Koreans to be more forthcoming with information," she said. 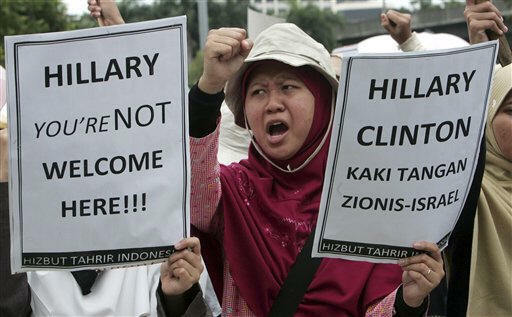 In Indonesia, Clinton will stress a new U.S. willingness to engage with Southeast Asian nations, many of which felt neglected by the Bush administration. On her final stop, in China, Clinton's agenda will encompass the full sweep of the economic crisis, global warming, clean energy, North Korea and health issues. Human rights groups have expressed concern that their issue has been relegated to the sidelines by the Obama administration. "We're not going to be shying away from talking about human rights issues, but we have a very broad agenda to deal with when it comes to dealing with China," Clinton said. "It's fair to say that this first trip will be one intended to really find a path forward to have as robust an engagement as possible on a range of issues." Copyright 2009 The Associated Press. All rights reserved. This material may not be published, broadcast, rewritten or redistributed.